The appetite is both a psychological and physical phenomenon. When we see a dish that looks good or smells nice, it stimulates an involuntary physiological response in the body. Having a healthy appetite is good, but an unnecessary increase in appetite can be problematic. 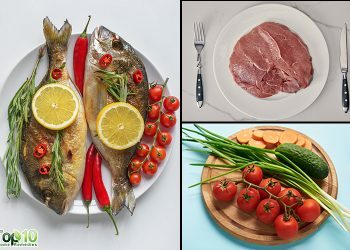 People may have an increased appetite due to an unhealthy lifestyle, mood swings, depression, boredom, stress, anxiety and various emotional factors. 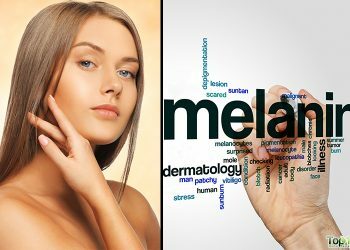 Also, certain conditions like premenstrual syndrome, bulimia, hyperthyroidism, Graves’ disease, hypoglycemia, diabetes and pregnancy can cause one’s appetite to rise. An increased appetite can last for a few days or longer, depending on the cause. It can lead to unhealthy eating habits, weight gain and many other health problems. Whether you are striving to stay healthy, lose weight or just want to change your eating habits, it’s important to keep your appetite in check. 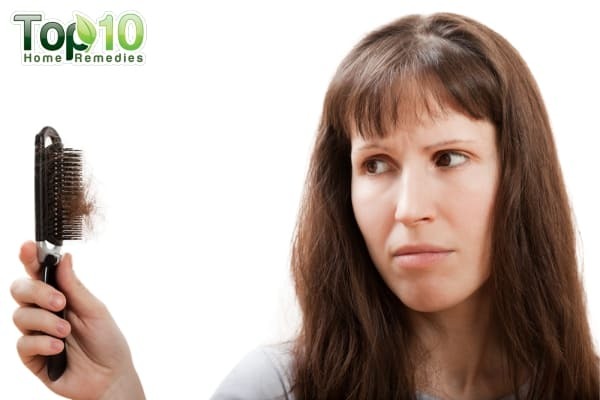 There are many strategies to help suppress appetite. Some of them are avoiding refined carbohydrates, getting adequate sun exposure and drinking plenty of water. You can also incorporate certain foods into your daily diet to help reduce your appetite. 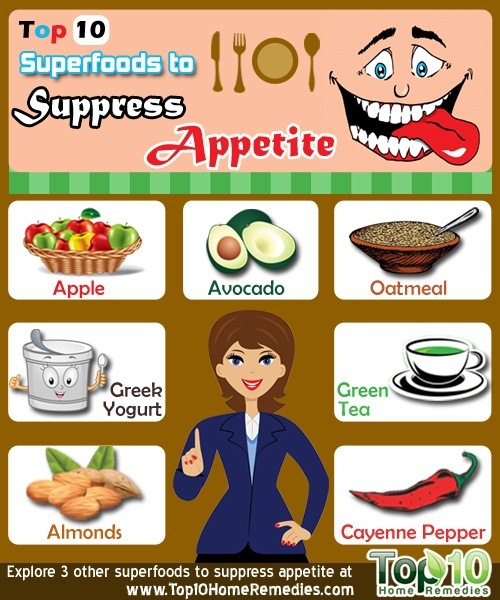 Here are the top 10 superfoods to suppress your appetite. You can stay fuller for a longer time with a bowl of oatmeal. Oatmeal contains fiber (both soluble and insoluble) and it helps increase an appetite-regulating hormone known as cholecystokinin in the body. Plus, oatmeal is a slow-digesting carbohydrate that helps keep blood sugar and insulin at optimum levels while speeding up the fat-burning process. On top of that, oatmeal also helps to lower LDL (“bad”) cholesterol and reduces blood pressure. To increase the satiating effect of oatmeal, eat steel cut oats with a little bit of cinnamon powder. Apples are a soluble fiber-rich food that keeps your stomach satisfied longer and helps prevent overeating. 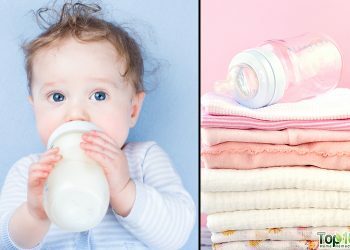 They have few calories and high water content, which are also key in controlling appetite. Plus, the pectin in apples aids weight loss and helps prevent blood sugar spikes that spur hunger. It also boosts your energy level. You can eat apples of all varieties, but you need to eat the apple with its skin. An apple is an ideal morning or afternoon snack. Be sure to chew an apple properly. The chewing time will give your body more time to realize that you’re no longer hungry. An excellent source of protein, Greek yogurt also helps suppress appetite. Greek yogurt also contains a good amount of calcium that helps control hunger pangs and helps your body keep going throughout the day. It also has the added benefit of its fat-burning potential. According to research done at the University of Tennessee, diets with at least three daily servings of yogurt also speed up the process of weight loss. You can enjoy the thick, creamy texture of the Greek yogurt as it is or add some fruit for a more filling snack in between meals. A glass of yogurt smoothie is also a good choice. Being rich in fiber, omega-3 fatty acids and protein, flaxseeds also help suppress your appetite and help you to stay satiated and fueled for a longer time. They are also a good source of omega-6 fatty acids, which may increase levels of the appetite-suppressing hormone cholecystokinin. You can sprinkle ground flaxseeds on your cereal, yogurt, salad and vegetables. You can even add one tablespoon of ground flaxseeds in your morning shake or smoothie to increase the nutritional value. Avocado is another superfood that can suppress appetite and reduce the urge to overeat. Being rich in heart-healthy monounsaturated fatty acids and soluble fiber, it takes a long time for the body to digest avocado. This provides a prolonged feeling of fullness. A recent study at the Albert Einstein College of Medicine at Yeshiva University in New York found that the oleic acid in avocado also helps suppress appetite and contributes to weight loss. Because avocados are high in calories and fat, eat this creamy fruit in moderation. Green tea, whether hot or cold, is one of the beverages that you can drink in between meals to suppress appetite and help you to stop mindlessly snacking. Green tea contains phytonutrients like EGCG that increase the hormone cholecystokinin, which is responsible for creating the feeling of satiation. Plus, the catechins in green tea slow the rise of blood sugar and prevent high insulin and subsequent fat storage. Stable blood sugar levels will also stabilize hunger cravings. Furthermore, green tea is packed with nutrients, such as vitamin C, carotenoids, zinc, selenium, chromium and other trace minerals. Drink about three to four cups of green tea daily to control cravings as well as promote weight loss. Almonds are a rich source of healthy fats like polyunsaturated and monounsaturated fats, which prevent you from overeating. These healthy fats also keep your cholesterol level low. Plus, almonds are a good source of appetite-killing fiber, which takes time to digest so you do not feel hungry more quickly. Almonds have also been shown to help with weight management, according to a study presented at the 2006 Obesity Society Annual Scientific Meeting. 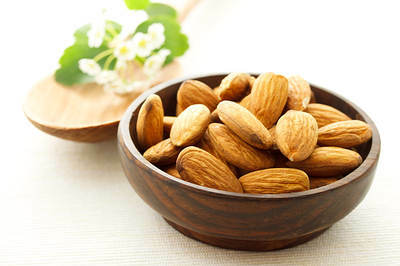 You can eat one-fourth cup of almonds daily in between meals or whenever you have strong cravings to eat. Opt for roasted or soaked almonds rather than sugar coated or salty ones. Spicy food like cayenne pepper has been found to help keep you feeling fuller longer. In addition, it contains a compound called capsaicin, which increases metabolism and will help burn fat and calories at a faster rate so you lose weight more quickly. 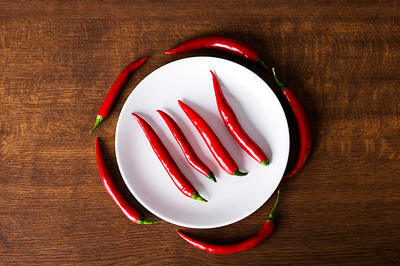 You can eat cayenne pepper raw, cooked, dried or in powdered form to control appetite. You can also make cayenne pepper tea by adding a cup of hot water over a pinch of cayenne pepper in a cup. Squeeze the juice from half a lemon in it and drink this tea in between meals. Green leafy vegetables are high in fiber and water, which keeps your stomach feeling full and turns off the hunger signals to your brain. 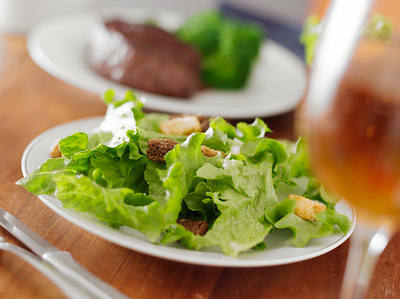 Plus, these low-calorie vegetables when eaten daily provide optimal health benefits and help in weight loss. 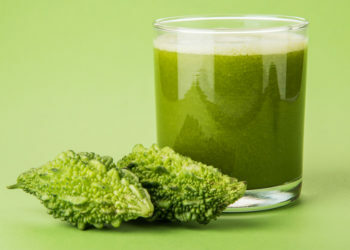 You can choose spinach, collards, mustard greens, kale or asparagus to make a green salad, a refreshing glass of vegetable juice or a bowl of soup. These vegetables make a satisfying and highly nutritious as well as delicious meal to keep hunger at bay. 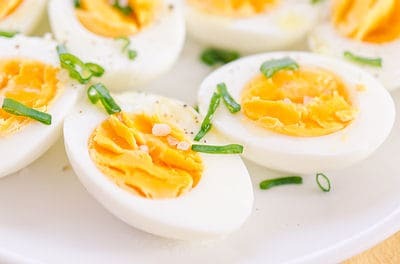 Eggs can also help you stop snacking between meals and curb appetite. Their satiating effect comes from the good quality protein in them which provides sustained energy. Eating an egg or two for breakfast can keep mid-morning hunger pangs at bay. According to a study, when people had scrambled eggs for breakfast they were less hungry at lunch time compared to those who ate cereal for breakfast. It is recommended to eat more of egg whites than the yolks since they are very low in calories, free of cholesterol and virtually fat-free. Egg yolks, on the other hand, contain high amounts of saturated fat and cholesterol. You must contact your doctor if you have an unexplained, persistent increase in appetite.